The latest Automotive M&A Market Report from Hampleton Partners, outlined how the world’s automotive manufacturers are competing fiercely with suppliers as well as newer market entrants, such as Waymo and Tesla, to acquire the cutting-edge auto businesses and technologies that are transforming the future of personal mobility and commercial transport. Hampleton estimates that the market is on track to deliver around 100 transactions in 2018, reflecting the fast-moving changes in driver behaviour and their quick acceptance of tech innovations such as parking payment; ridesharing; carpooling and car purchasing apps and portals. The Hampleton report reveals that deal values were up 54% in the first half of 2018 vs. the same period in 2017, reaching $2.9bn, though undisclosed transactions will more than double this figure. OEMs such as Daimler are transitioning from being an automobile manufacturer to a mobility services provider. The company acquired six companies in the sector over the past 30 months, including Transvoco, the French ride sharing mobile app; Advanced Telematics Systems, which updates the electronic control unit (ECU) over-the-air, and Flinc, a ride sharing mobile app. 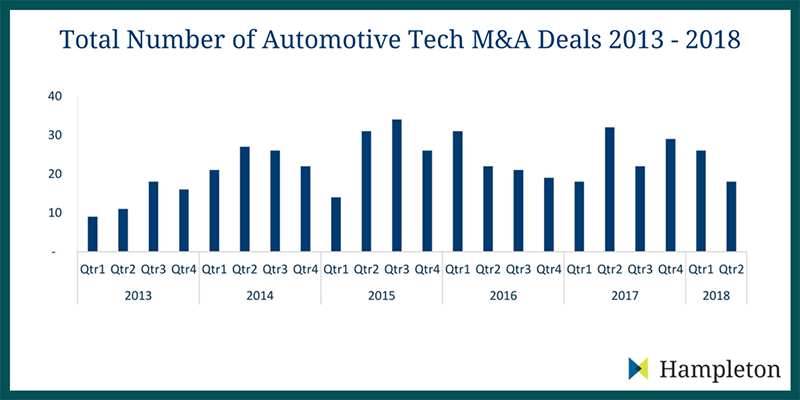 The number of private equity transactions in the autotech sector totalled ten announced deals this year, up from just a handful from the full year in 2017. This increase in investment flowed into early stage companies as well as more established business models. While the lion's share of private equity transactions involved a US-based firm, London-based Vitruvian Partners and Verdane Capital, a Northern European private equity and venture capital firm, announced a $350m investment into EasyPark Group in the sector's second largest deal by a financial buyer in 1H 2018. The Gores Group claimed the top stop with its $1.3bn acquisition of Verra Mobility, the traffic safety, toll and traffic ticket hardware, software and services company, a move that saw robust multiples paid at 6.6x revenue and 17.2x EBITDA. With its $500m acquisition of KUM, the South Korean manufacturer of speciality automotive interconnect technologies, Aptiv came in second place for disclosed deals, adding significant muscle to its Asia-Pacific operations. In addition to the two above disclosed deals, multiple transactions rumoured to be in excess of $1bn also took place. These include DiDi Chuxing’s billion-dollar takeover of Brazil-based rival 99 Taxis, as well Stone Point Capital’s purchase of collision claims management company Mitchell International. In an age of cyber hacks and vulnerabilities, with connected cars becoming a reality, companies are looking to acquire or invest in solutions that improve trust and reliability. Any technology that has the potential to improve safety on the roads in an era of autonomous vehicles is a financial target. Examples include Stone Point Capital’s acquisition of automotive collisions claims and repair outfit Mitchell International, for a sum rumoured to be north of $3bn, and German automotive collisions analysis outfit ControlExpert which was acquired by General Atlantic last year.